Hand built to much the same way and to the same specifications as shop blinds were 100 years ago, with a few exceptions such as seamless steel tube for barrels and acrylic or PVC materials for the covers. All softwood pressure treated and painted to customers required colour. Most old shop blinds can be repaired or refurbishmed, usually a fairly straight forward job and also cost effective, which means the old system can be kept servicable and looking good for many more years. Designed and constructed to be installed into a purpose built blind box, or adapted to suit an existing blind box. Operation by manual rod crank, or electric with optional automatic sun and wind sensor. The flat front aluminium fascia lath and blind arms can be custom painted to match an existing shop front colour or are available in 47 standard RAL colours. Vast range of fabric colours are available in acrylic or PVC, also ideal for sign writing, valances and side covers can also be added. The Niche Type N 2000 is designed especially for a purpose built or existing blind box. The front rail closes the niche to the front of the box. The cover is fully protected as is the technology within. 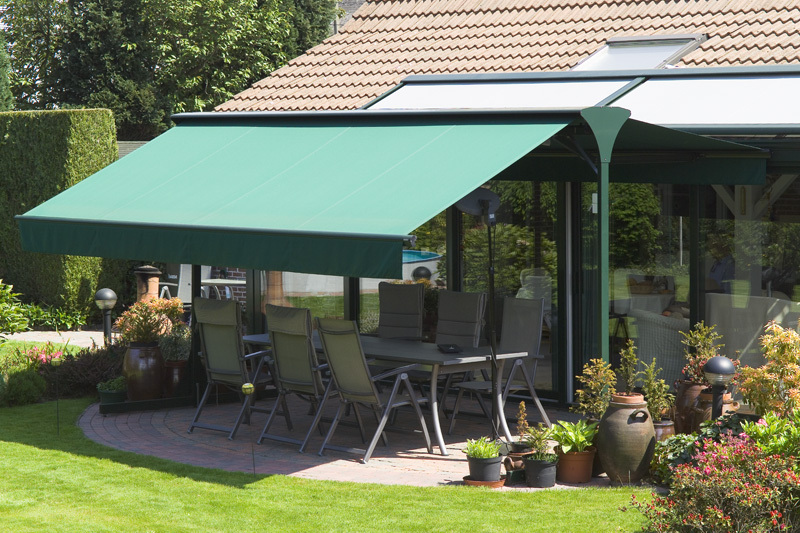 Stylish and practical, the folding arm awning is suitable for patios, balconies and shopfronts, in three basic types, Full Cassette, Semi Cassette and Open Fronted with or without top hood. Single awnings available up to 7m in width and 4m projection, coupled awnings up to 12m wide. Awning frames are available in standard colours, or can be custom paint finished to any standard RAL colour, and special textured finishes also. Awning fabrics, standard acrylic, impregnated acrylic, waterproof and fire retardent acrylics, PVC fabrics. Operation by rod crank or electric with remote control, optional automatic operation sun / wind / rain, lighting and heating can also be added. 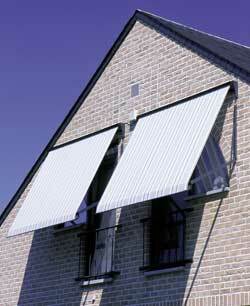 Ideal for windows which require a deeper shaded area, windows receiving a low sun, and high level windows. Drop arm awnings are also very practical for commercial and shopfront applications where sign writing is a particular requirement. 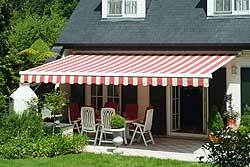 Single awnings up to 5m wide can be achieved with 2 arms, or awnings can be coupled up to 10 meters in width (two part cover) with 3 arms or more. The area of drop is variable, angles between 0 and 120 degrees, and is an excellent blind system for using sunscreen fabrics which are almost transparent when looking out. Fabric standard acrylic or sunscreen material, frames in standard colours or custom painted to any standard RAL colour. Operation by manual rod crank or electric, with remote control, optional automatic sun / wind and rain sensors can be added. 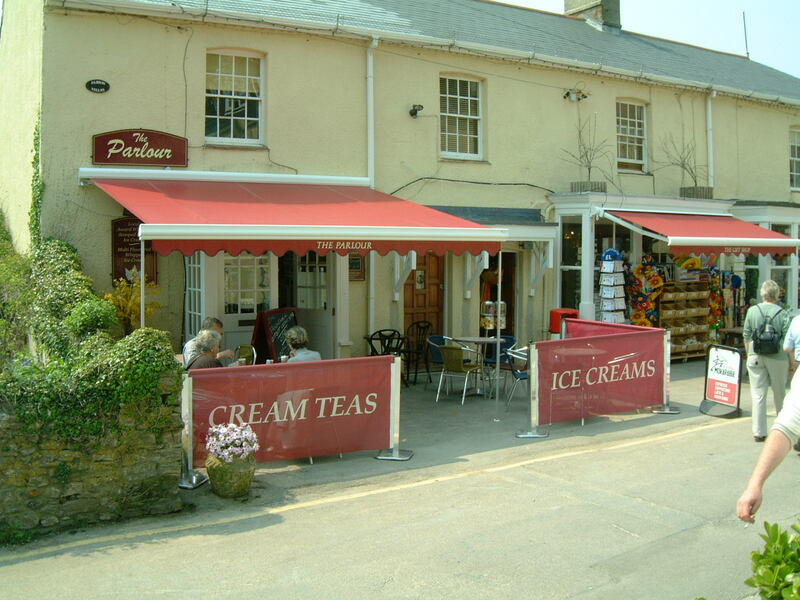 Popular for both domestic and commercial applications, a very effective awning for shading smaller windows, can also add character and style to a large shop front, this style of awning is ideal for sign writing. 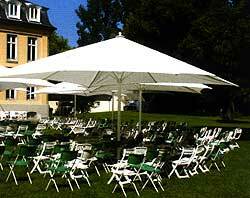 A very stable awning in strong wind conditions, many frame variations are possible, with square or rounded corners, fixed frame or retractable versions, operation by a simple cord pull with tie off cleat, rod crank or electric operation for larger awnings. Low maintainance and easy to remove for winter storage. 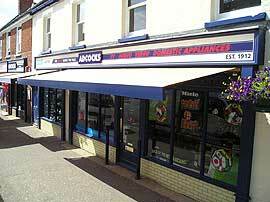 An economical but practical awning, and very cost effective to recover the frame with a new fabric. Designed to be installed on top of the roof structure, stops heat and glair at source, with covers available in either acrylic in a wide choice of colours and designs or special sunscreen fabrics to reduce the heat and filter the light. A range of standard frame colours, or can be custom paint finished to any standard RAL colour. Operation - electric only with a wall mounted switch or remote control, can also include automatic sun / wind and rain sensors. 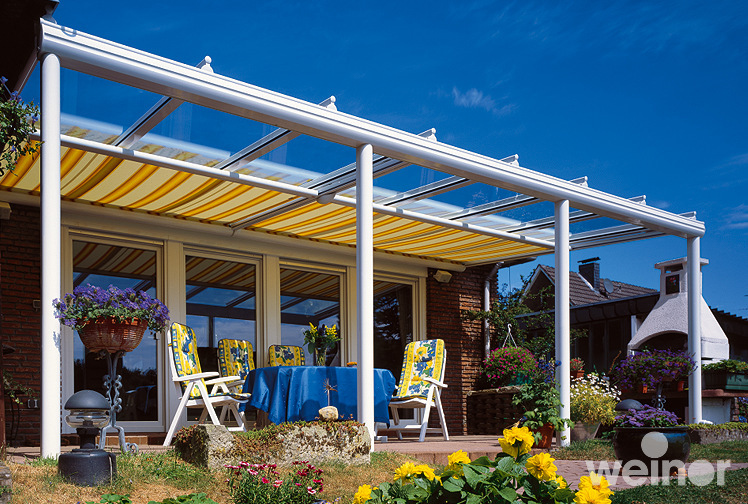 Also an ideal retractable awning for fixing on top of timber pergola or steel type sub frames. Maximum width available in a single unit 6.5m, or can be coupled together for wider installations; a maximum projection of 6.5m is possible depending on width. 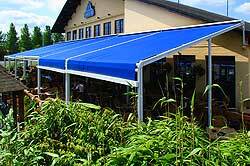 Terrace Awnings mainly used commercially for the restaurant, hotel and pub trades, to provide shade and protection for large outdoor areas. Robust aluminium fixed subframe powder coat paint finished in white or brown as standard, or can be custom painted to any standard RAL colour. Quality fabrics in standard or special impregnated acrylics, in a range of plain or striped designs .Available options include rain gutters and drain pipes, additional wind bars , intergrated heaters and lighting, side sheeting protection and sign writing .Operation by electric motor, with the option of wind sensors to automatically retract the awning in severe weather and windy conditions. Often described as back to back awnings, up to 7 mtrs wide with up to 4 mtrs projection on either side, designed to provide shade to patio areas, terraces of caf�s, restaurants, clubs, pubs and hotels. The HAROL Duostore (pictured)comes in three standard widths of 3.6 m, 4.8 m,and 6 m, with projections on each side of 1.5m , 2.0 m, 2.5 m and 3.0 m. frame colours of white or brown as standard, or frame can be painted to any standard ral colour, covers are acrylic, in a wide choice of either striped designs or plain colours. Operation by manual rod/crank or electric with remote control, with the option of automatic wind sensors, lighting and heating. 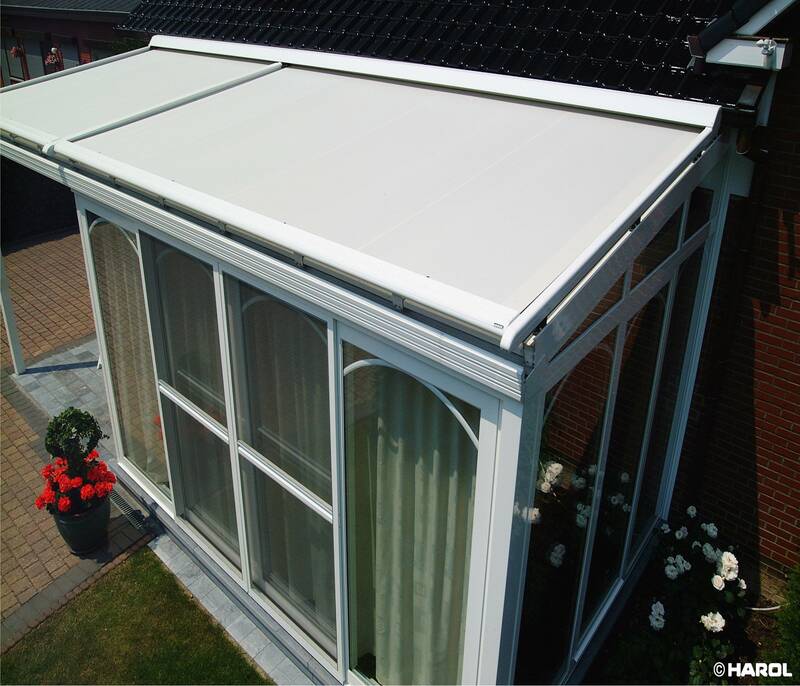 Glazed Patio Roofs (Terrazza), gives you an option to use your outdoor space all year round, an aluminium construction for ultimate protection of terraced or patio areas. Choose from 47 standard frame colours, or 5 special textured paint finishes for the framework, with either glass or polycarbonate roofing. Dozens of shape variations are possible, and can also be used for covered walkways, covered play areas in schools, smoking shelters and garage carports. Optional extras include, awnings for over or under the glass, roll down screens for the front and or sides, pull out wind break screens, glazed side panels, heaters and lighting. 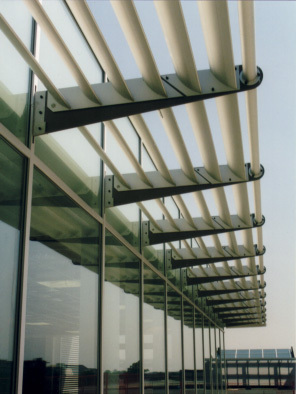 Brise Soleil Sunscreens are used to help reduce solar heat gain through glazing, a practical and important consideration in modern buildings, also adds another dimension to architectural design. Constructed from a range of aluminium blades, in flat or ellipsoid form, which can be fixed, usually horizontally, but can also be fitted vertically or at a determined angle. The aluminium blades and fixing arms, come in natural anodised or can be powder coat paint finished to any standard Ral colour, mounting brackets are in steel which is plated and powder coated, or in stainless steel. Adjustable blades are also available, which have pivot axles housed in a top and bottom track, control is by an electric actuator fitted to the blades connecting rod. Probably the most effective method of solar screening, and control of solar heat gain, for both Commercial and Domestic applications. 5 slat sizes and shapes available, slats can be tilted to optimise light and shade. EVB`s can be automatically lowered when the sun is shining and raised again when not required. Type F80, flat 80mm slats, cable guided. Type K80, curved 80mm slats, rail guided, and held with suspension cord. TYPES T60/T80, special shaped T slats, rail guided, with a low stack height. Type VZ70/VZ90, slats joined together for greater stability, rail guided. 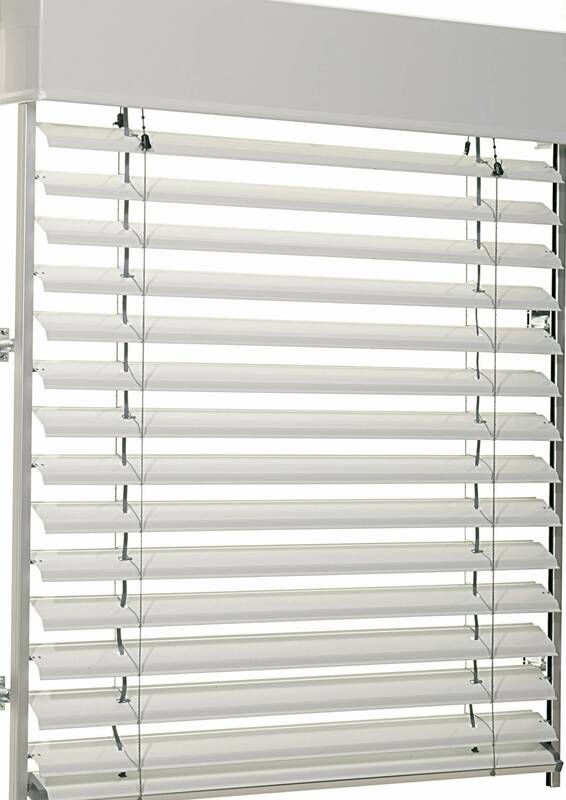 Standard slat colours are White, Silver, Beige and Brown, with the option powder coating to any standard RAL colour. Easy to use and very popular, for the home, restaurant, pub trade or outdoor play areas . Easy to operate via winding handle, and low maintainance. Framework powder coated aluminium, wide choice of acrylic or polyester fabric colours in plain or stripes, storage covers for winter. Can be surface mounted with mobile floor stand or located into a fixed ground sleeve. Models, sizes and shapes vary (round, square or oblong) up to 8m x 7m. The Cafe` Barrier is a versatile, robust and portable solution for defining an outside space. Creating an area for additional seating, or a smoking zone which complies with the new regulations. Cafe` Barriers are suitable for both indoor or outdoor use. The posts are 810mm high, weight approx 17 Kg, brushed stainless steel, and with solid top and bottom rails, the banner fabric can be in PVC or Acrylic, ideal for sign writing with your logo, branding or message.